This is what I drink when I want a milkshake without milk. 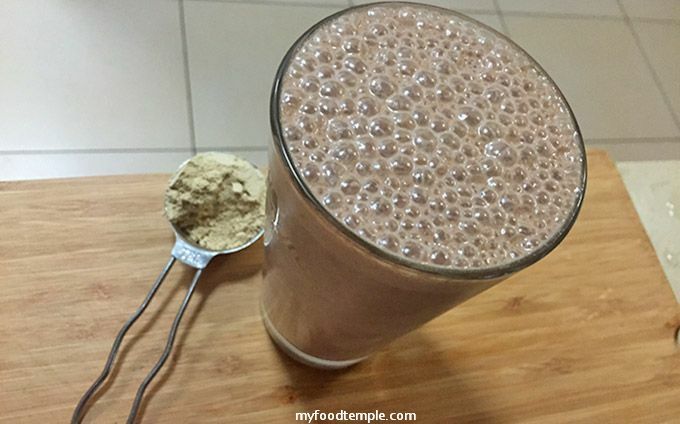 I often call it a Choc Maca Shake, but in reality, it is a smoothie. This delicious Chocolate Maca Smoothie is packed with the goodness of golden flax flakes, maca powder, natural cocoa and banana. It has what I can only describe as a very fresh chocolaty maca taste with a crisp clean cut edge and is totally yummy! Place all ingredients in a strong blender and blend until smooth. So Good Regular Soy Milk ( This brand tastes good and is packed with Vitamin D, B12 and Calcium and doesn’t have some of the nasties that other soy milks have). But when I have a chance I often make my own almond milk and use that. Maca powder (good source of iron, vit B6, calcium, niacin) Maca powder is known to help support mental and emotional health, and to support hormonal activity, the nervous system and reduce fatigue. Natural quality cocoa powder (use a brand with minimal processing or ideally natural raw cacao powder) – ability to boost endorphins and good quality natural powders have fibre, a good smack of iron, magnesium, zinc, copper and manganese.